The Capsuhelic® gage is designed to give fast, accurate indication of differential pressures for oil- and water-based liquids. The gage may be used as a readout device when measuring flowing fluids, pressure drop across filters, liquid levels in storage tanks and many other applications involving pressure, vacuum or differential pressure. Using the basic design of Dwyer's time-proven Magnehelic® gage, the Capsuhelic® gage contains a simple, frictionless movement that permits full scale readings as low as 0.5 inch water column. The pressure being measured is held within a capsule which is an integral part of the gage. This containment of the pressure permits the use of the gage on system pressures of up to 500 psig, even when differentials to be read are less than 0.1 inch w.c. The diaphragm-actuated Capsuhelic® gage requires no filling liquid which might limit its outdoor applications. Zero and range adjustments are made from outside the gage, and there is no need to disassemble the gage in normal service. The Dwyer® Series 4000 Capsuhelic® differential pressure gage is ideally suited for use as a read-out device with the DS-300 Flow Sensors. The gage may be used on system pressures of up to 500 psig even when the flow sensor differential pressure to be read is less than 0.5" w.c. With accuracy of ±3% of full scale, the Capsuhelic® gage can be used in ambient temperatures from 32 to 200°F (0 to 93.3°C). The standard gage with a die cast aluminum housing can be used with the flow sensor for air or oil applications. For water flow measurements, the optional forged brass housing should be specified. 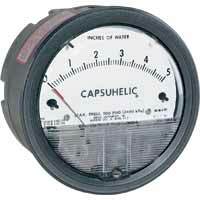 The Capsuhelic® gage may be panel or surface mounted and permanently plumbed to the flow sensor if desired. The optional A-610 pipe mounting bracket allows the gage to be easily attached to any 1-1/4" - 2" horizontal or vertical pipe. Service: Aluminum Case: Air and compatible gases and oil based liquids. Brass Case: Air and compatible gases and water based liquids. Housing: Die cast aluminum with impregnated hard coating, standard. Optional forged brass housing is required for water or water based fluids.Special material diaphragms available, contact factory. Accuracy: ±3% of full scale at 70°F (21.1°C). (±2% on 4000S models, ±4% on 4200, 4210, 4215, 4220, 4300, 4400, and 4500). Pressure Limits: -20" Hg to 500 psig. (-0.677 bar to 34.4 bar). Temperature Limits: 20 to 200°F (-6.67 to 93.3°C). Weight: 3 lb, 3 oz (1.45 kg) aluminum case; 7 lb, 13 oz (3.54 kg) brass case. Standard Accessories: Two 1/4" NPT plugs for duplicate pressure taps, four flush mounting adapters with screws and four surface mounting screws. Capsulhelic® gages may be flush mounted in a panel or surface mounted. Hardware is included for either. For flush mounting, a 4-13/16" diameter cut-out is required. Order optional A-496 heavy duty flush mounting bracket for high-shock or high-vibration applications. Optional A-610 kit provides convenient attachment to horizontal or vertical piping. All standard models are calibrated for vertical mounting. Gages with ranges above 5 in. w.c. can be factory calibrated for horizontal or inclined mounting on special order. A-298 - Flat aluminum bracket for flush mounting Capsuhelic® gage. A-309 - 3-way manifold valve. A-370 - Mounting bracket, flush mount Capsuhelic® gage or Series 631B Transmitter in bracket. Bracket is then surface mounted. Steel with gray hammertone epoxy finish. A-496 - Heavy duty flush mounting bracket for high shock or vibration applications. A-610 - Pipe mounting kit for 1-1/4" to 2" pipe.